These amazing gift boxes are a great way to ask your very best girlfriends to join you on your most important day. We absolutely love this spa themed one offered by Lizush. It includes cute items like a Scented Soap flower with a tag saying, “I can’t say “I do” without you” and fun hair ties featuring the saying, “Will you help me tie the knot?”. And to top it all off you get a to add your own personal note printed on a beautiful card! Want to keep them guessing? Then these fun puzzles created by XOXOKirsten are perfect! They have amazing designs that will fit the theme of any wedding. Or you can add your our personalization by adding a photo of you and your best girlfriends for a custom touch! Want to pop a little bubbly in the process? These cute kits from Relish Print Design are exactly what you need to say cheers to the newest member of your bridal party. 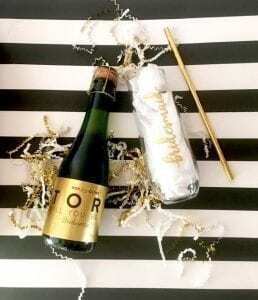 The kit comes with a personalized stemless champagne flute and a customizable label. Simply add a mini bottle of the good stuff and your all set! Want more great ideas to make your wedding uniquely you? Contact Magnificent Moments Weddings! We would love to help you with all things big and small!